Frozenbyte's Trine was a masterpiece of a puzzle platformer, testing the minds and responses of adventurers with physics-based puzzles, platforming and plenty of action tossed in-between. Trine 2 does all of that, but much better with new features and even online co-operative gameplay, something that fans have been longing for since the first game made its debut in 2009. Two years later and the mysterious artifact known as the Trine has returned, reuniting Amadeus the Wizard, Pontius the Knight and Zoya the Thief for a brand new quest. Goblins run amok, spreading terror throughout the kingdom and it's up to the trio to find out what in blazes is going on. 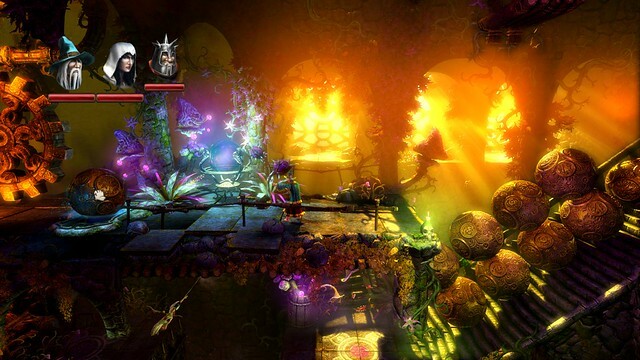 The Trine will take our misfit band of heroes to some rather colourful locales where players can expect plenty more puzzles, platforming and action to go around. It's a fun story altogether, albeit predictable, but despite the simple narrative, the characters make up for it by injecting their unique personalities into the story with fun little banter. Amadeus isn't all too excited on embarking on yet another adventure, unlike the gung-ho Pontius who can't wait for his next noble quest, meanwhile Zoya's just looking forward to the treasure that awaits her. Gameplay remains the same as the first game. Players are tasked with reaching the end of each stage, preferably with each hero in one piece. The game is set on a two dimensional plane where players will have to run, jump and solve whatever puzzles they encounter. To aid in this undertaking, each hero possesses unique abilities that players can exploit. Amadeus, for example, can conjure up boxes and planks to create makeshift paths; he is also able to lift up or hold objects in the game world using his magics. Pontius, on the hand, is the tank of the group, able to push or, even better, smash things out of the way with his trusty sword and hammer. Using his shield, Pontius can repel enemy attacks as well. Zoya's the little acrobat of the team, able to swing over large gaps with ease thanks to her grappling hook. On top of that, she can hit enemies from afar with her bow and arrow. New to Trine 2 is the inclusion of an abilities tree. Rather than give players all available skills from the get-go, players will have to gain experience, level up and invest points in their desired skills. Amadeus can eventually learn to conjure up more than a single box, a plank and even lift up enemies. Meanwhile, Pontius and Zoya can learn elemental attributes such as the Frost Arrow, Frost Shield and Flame Sword. Pontius can also learn to throw his hammer, which is surprisingly helpful. With that said, the ability tree itself feels a little bit like filler. Aside from Amadeus' ability to multitask his magic, skills for Pontius and Zoya leave a lot to be desired. While their skills technically have inherent passive abilities, it doesn't really show all that much in the actual game. For example, Frost Shield supposedly slows down enemies when they attack and Fire Sword inflicts more damage, but its effects just aren't obvious and, more often than not, it results more in an aesthetic upgrade than a helpful mechanic.The puzzles aren't quite as challenging as one might like, but they aren't stupendously easy either. They range from pulling levers, applying counter-weights or timing jumps. Usually in tandem. Players can expect to use whatever skills they have at their disposal to solve each challenge. The game also introduces a new type of puzzle involving enchanted mirrors "“ in essence, portals! It's a nice touch and adds another level of depth to the game. Long story short, the puzzles will make you think, but you won't be thinking for long. Enter three-player co-op and things start to change, and not necessarily for the better. Don't misunderstand, this game was built for co-op and it's quite a lot of fun. What's disappointing is that most of the puzzles can be easily solved by having one player use Amadeus to conjure up a box or plank, then carry the other players across whatever challenge that lies in their way. Other than that, players can expect to enjoy both the local and online co-op modes. The latter of which doesn't suffer an intolerable amount of lag. Starting a co-op game is as simple as launching a lobby and inviting your friends, or searching online and joining a game. Moving on to presentation, Trine 2 is a visual stunner, both in terms of art direction and technical graphics. Locales are brimming with colour and weight. The physics do well to add depth to the world and in-game elements. Most impressive are the water physics and visuals. Simply watch as water flows and ripples when disturbed, or see the view get warped when you dive underwater. The sound design complements this perfectly. Speaking of which, the soundtrack is quite whimsical and certainly enjoyable, a perfect match for the title at hand. Trine 2 is a great game, no doubt about it. It suffers some mechanical faults, but the overall experience is still a good one. The gameplay is fun, especially together with friends, the puzzles are relatively challenging and the visuals and sound are just astounding. The graphics are easily the best thing about the game, not that the rest of it is bad, far from it. 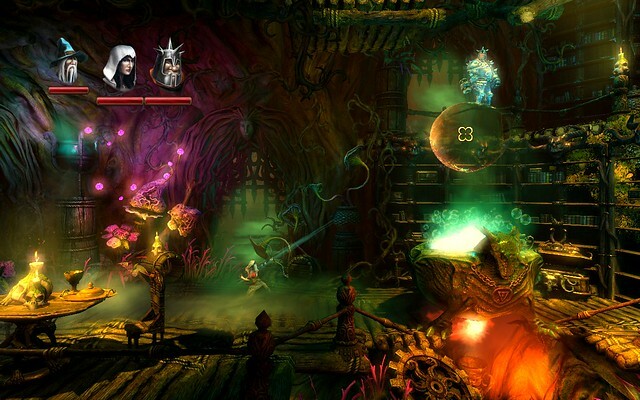 If we're naming the prettiest game of the year, Trine 2 is definitely a worthy contender. Visuals and sound are astounding. Gameplay is solid and functional. It's bug free! Relatively challenging, depending on how many players are joining in the quest. Puzzles can be easily solved in co-op. Some mechanics like the ability tree leave a bit to be desired. Story, while fun, isn't the most engaging.